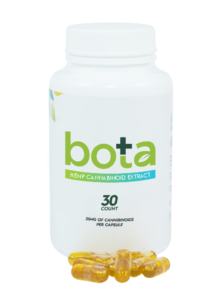 CBD Capsules 25mg by Bota Hemp are made from 100% pure pesticide free, non-gmo hemp oil extracted from stalks and stems of the industrial hemp plant. 30ct bottle with 25mg CBD per capsule. Cpsules will allow you take your CBD dosage simply and easily– just swallow a capsule. CBD capsules are popular with people on the run who want a clean, consistent and portable way of getting your daily cannabidiol dosage.